The NICO100C-MRI Impedance Cardiography (ICG) Noninvasive Cardiac Output Module for Magnetic Resonance Imaging records specific parameters associated with cardiac output measurements. The NICO100C-MRI simultaneously measures impedance magnitude (Zo; labeled “Z”) and derivative (dZ/dt; labeled “DZ”) and incorporates special features to help improve measurements during EPI or other scanning sequence in fMRI or MRI. 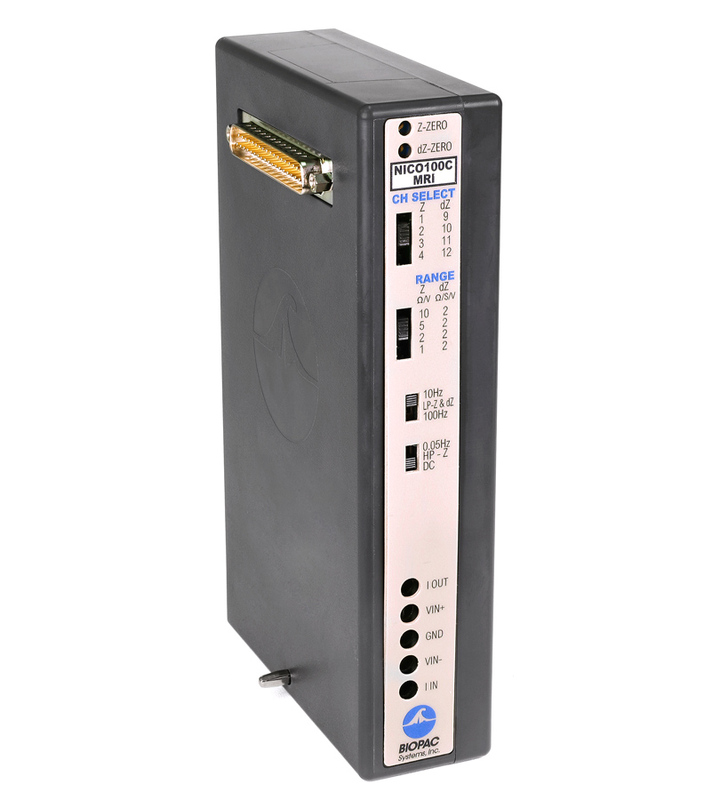 Features include optimized filtering and slew rate limiting for the Zo and dZ/dt signals. Zo and dZ/dt are recorded at a stimulation frequency of 50 kHz. 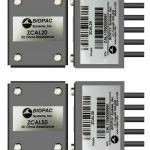 The module incorporates a precision high frequency current source, which injects a small (4 mA rms) sinusoidal measurement current through the thoracic volume defined by the placement of a set of current source electrodes. A separate set of monitoring electrodes measures the voltage developed across the thorax volume. Because the current is constant, the voltage measured is proportional to the impedance characteristics of the thorax. The NICO100C-MRI requires the MECMRI-NICO filtered cable set and is used as part of a complete research system, interfacing with the MP160/MP150 data acquisition and analysis platform and AcqKnowledge software, allowing advanced analysis for multiple applications and supporting acquisition of a broad range of signals and measurements. AcqKnowledge includes automated tools for the automatic analysis of impedance cardiography (ICG), cardiac output and other hemodynamic parameters using noninvasive bioimpedance techniques. The software automatically scores the data and provides tabulated results in either a Journal file or Excel. Condition: NICO100C-MRI Amplifier stays in the Control Room and is used with the MEMRI-NICO filtered cable set and recommended MR leads/electrodes/transducers; tested to 7T. For operation, the NICO100C-MRI typically connects to the MECMRI-NICO Cable/Filter set. This set incorporates 2 meter cable that connects the NICO100C-MRI from the control room to the patch-panel-attached Pi filter, which pokes through to the chamber room where an 8 meter cable connects between the patch panel filter and the subject electrode leads. 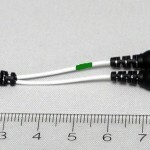 A typical setup uses four “Y” electrode lead adapters (CBL204-MRI) that connect to eight carbon composition unshielded electrode leads terminating in Touchproof sockets (LEAD108B and/or LEAD108C) for connection to disposable carbon composition electrodes (EL508, MR Conditional to 7T; the NICO100C-MRI can also function with other electrode types). Apply skin preparation gel (ELPREP), then clean/dry skin, then apply electrodes. If electrodes appear dry, and assuming electrodes are not hydrogel type, then more conductive gel (GEL100) can be applied. 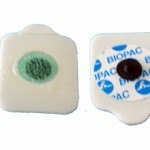 IMPORTANT: BIOPAC recommends using the shortest possible electrode leads for recording in the fMRI or MRI.